Looking for the best TV for sport? We suggest you go 4K, especially now it’s confirmed the BBC will be broadcasting its World Cup matches in UHD. 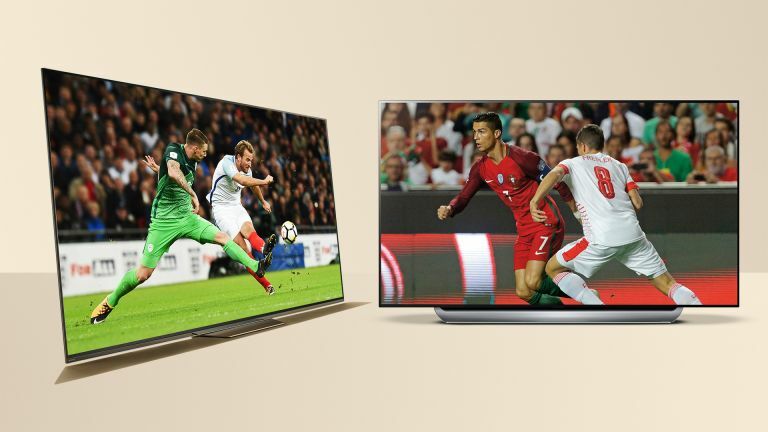 From refreshingly fast OLED and LED TVs with superior motion handling, to immersive Ambilight, these TVs will make the beautiful game even more so. With England, ahem, cruising through the Group of Death, against mighty Tunisia and Panama, now is the time to buy, if you're an England fan. If you're a fan from somewhere else in the UK, you can also buy one and enjoy them pluckily crashing out in the second round. If you hate football, they’re also good for rugby, athletics, tennis and – using the Duckworth/Lewis method, cricket. Big sporting events are often cited as a key reason to splurge on a new telly, no more so than when a World Cup hoves into view. But don’t just be tempted by the first money-off deal you see when buying a new TV to watch sports. Manufacturers will schedule the launch of entire ranges to coincide with epochal sporting events – and indeed they have for Russia 2018 – and line-up a heap of special promotions to tempt armchair athletes. Cheap tellies, bundled soundbars, freebie Blu-ray players, 300 quid cashback if England don’t immediately crash out: you name it, there’s likely going to be a deal on the streets you’ll struggle to resist. But there’s much more to buying a new TV for sports than just opting for the biggest panel at the lowest price. Actually that's true in general. Pick the right set and it’ll reward you with better images than lesser rivals. Brands which have made an art of motion handling can dramatically enhance the clarity of frantic onscreen action. Clearly, your choice of display technology, be it OLED or LED LCD, can make a big difference. And with both Sky and BT now offering 4K sports coverage on a regular basis, while the BBC dips a toe in those waters, it makes sense to invest in a UHD model rather than regular HD. Here, we've gone for a mix of affordable TVs (and one projector) that have attributes that make them perfect for watching sport, with some ringers that are just great, premium TVs that are good at everything, including rendering sporting action in pristine fashion. Sony has always enjoyed an enviable reputation when it comes to motion handling, it’s Motionflow image processing wizardry somehow able to eek more clarity than its rivals from fast moving material. The XE90 doesn’t let the side down, and exhibits very effective motion smoothing. This 100Hz screen has a direct LED backlight, which also helps keep action crisp and tonality even. The XE90 is a smart looking set too, thanks to a smart aluminium trim and central pedestal stand. Naturally net-connected the set uses the Android OS, supported by a YouView programme guide with roll-back EPG and catch-up services, useful it you forget to timeshift Gary Lineker. Chromecast is built-in, while streaming services include the Netflix, Amazon Prime Video and YouTube. The set is compatible with HDR10 and broadcast HLG, but the dazzle doesn’t end there. The X1 image processor also has Object Based HDR Remastering, which is used to give regular SDR content an HDR-style boost. Clarity is further helped by Sony’s excellent 4K X-Reality Pro image processor, which studiously adds subjective detail without creating unwanted artefacts. Colour saturation is high, and black levels deep. The TV even has a crowd pleasing audio performance, courtesy of its 2x10w sound system. It’s a winner all round. An official product of World Cup 2018, the U7A continues Hisense's usual practice of providing great TVs at affordable prices. The design and unfussy OS belie the price ticket and 4K UHD image quality is absolutely cracking. The set looks fine with HD, and excellent with native 4K, so long as you choose the right image presets, there's real wow factor here. Even if it's not a class leader when it comes to HDR peak brightness, the solid black level and strong colour performance are impressive. More importantly, highly effective motion handling ensures this sporty UHD screen is punching above its weight in the top flight, like Burnley, or Liverpool. For added sportiness, there's a Sports mode to handle fast motion and make pitches and football strips look super vibrant. The U7A also auto-detects when sport is on the box, and advises you to turn on the mode. Oh and there's a Russia 2018 logo that appears when you turn the U7A on. That will never get old. The AF8 is a 4K OLED flatscreen that oozes class, available in 55- and 65-inch screen sizes. It is also the Brazil 1970 of football-viewing screens. If you fancy a quick burst of FIFA 18 between real-life matches, gaming performance is not going to disappoint, but there are definitely better sets when it comes to console gaming. Stick to the live stuff and you can't go wrong, though. +Bright image helps with daytime games+Dedicated football mode! All of the World Cup 2018 football action will be during summer daylight hours, which might make you rule out using a projector if you don't have the ability to black out your viewing room. However, the TK800 from Benq is one of a new breed of DLP projectors with high maximum brightness, without being hugely expensive. With a quoted 3000 ANSI lumens maximum brightness, the TK800 is very watchable in any conditions short of direct sunlight hitting the screen. A reasonably short throw (3.25 meters gives you a 100-inch screen) means setup is fairly simple, although you will need it very square on to your screen (or white wall) as there is no lens shift. You do at least get vertical keystone correction, which offers some flexibility. The pay-off for your setup efforts, however, are rather spectacular. And huge. The 4K images are excellent for the price, especially with HDR video. The BBC's HLG is not supported so you won't get the benefit of that when using its 4K World Cup streams, but fire up the 'Football' mode and you get an image that is very vibrant. There's no specific motion smoothing technology here and the 4K is DMD ('doubling up' a 2K image using very rapid switching and clever processing) rather than native UHD. Regardless of that, for sports in particular, visual performance is excellent for the price at both HD and 4K resolution. It's not like you'll need to chuck the TK800 out after Russia 2018 concludes, as it also does a decent job of rendering movies and general TV. However, it is best when used as a sport projector, not least because during the quieter parts of movies, the projector's whine is quite noticeable. Over the din of John Motson and 100,000 fans (through an external speaker), that's not a problem. There are some complaints on Amazon of poor 3D performance. We have not tested this element of the TK800, but it may be worth bearing in mind, if you are a 3D fan. For sporting action, the A1 is not far off the standard of its successor the AF8 above, with the same panel and only slightly lesser image processing. Build quality and finish are even higher, if anything, though it is more difficult to put on a stand due to its unusual, leaning design. Shop wisely, and you’ll score a sweet deal on this Panasonic. It can currently be had for less than at launch, with the 58-incher less than a grand – quite a saving on its original £1699 price. There’s no skimping on build quality. Design is excellent. The X-shaped pedestal is height adjustable, and swivels for the best possible viewing position. It offers a choice of Freeview Play or Freesat tuners, while the Smart OS is Panasonic’s own My Home Screen V2.0 portal. It’s clean and customisable, with Netflix, Amazon Prime Video and YouTube all in 4K, for those rare times when you’re not glued to the game..
Picture detail is high, with colours rich and vibrant, thanks largely to Panasonic’s HCX Processor. This UHD set is also HDR10 and HLG compatible, which will be useful once HDR sports broadcasts begin. Panasonic rates the set’s panel driver at 2400Hz, coupled to the brand’s Intelligent Frame Creation interpolator. Translated, that means the set handles motion well, so you’ll be able to keep a closer eye on the track. The onboard speakers aren’t anything to shout about, but that’s nothing a good soundbar won’t sort. Bonus points: there aren’t too many 4K screens available in a 58-inch screen size, but this one is, and it's an easy-to-justify upgrade from 50- or 55-inches, making this even more of a crafty option for sports enthusiasts. The more screen inches you have, the more you’ll appreciate the 4K resolution offered by Sky Sports and BT Sports UHD programme coverage. OLED TVs are significantly better at handling motion than LED LCD models. A response time that’s 1000 times faster (yes, 1000) makes these TVs inherently very suitable for sports. That's an observation that applies equally to OLED screens from all brands, but the B7 is exceptional value as it's not a little older. The B7 sits below LG’s C7, G7, E7 and W7 models in terms of price, but it doesn’t sacrifice picture quality or features. High Dynamic range support covers HDR10, HLG and Dolby Vision. Detail is high, and black level performance peerless. Connectivity is good too. You get four HDMI inputs, all HDCP 2.2 compatible, plus three USBs. The set has a Freeview Play tuner plus LG’s webOS connected platform. It’s here you’ll find a full fist of catch-up TV and Netflix streams with Dolby Vision. There's also Amazon Prime Video and YouTube in 4K. There’s another element to the home viewing equation which can seriously enhance the sporting experience - and that’s sound, which is where this B7 scores, even though it's built-in speaker is nothing to write home about. Both Sky and BT are both producing content with Dolby Atmos audio, including premier league football, F1 and boxing, and the LG B7 range has a Dolby Atmos decoder able to recognise the 3D audio standard and pass it through HDMI ARC to a waiting Dolby Atmos soundbar or AV receiver. With Atmos height channels, it sounds as if you’re at the event and not just watching in your jammies. If you need to feel like you’re in the Emirates stadium rather than just watching it, a curved TV could be high on your list. Sit close enough and that curvy screen should pull you right into the action. The QE55Q8C is a QLED panel, and as such represents the best imagery that Samsung currently has to offer. Colour depth is considerable, and there’s a dynamic 4K HDR performance, be it with HDR10, broadcast HLG HDR or HDR10+. Peak brightness capability is upwards of 1500 nits. That’s really, really bright. Samsung TVs also boast ruthlessly effective motion interpolation, which is crucial for retaining detail in fast moving sports like football and tennis (essentially anything with balls). The thin-bezel set looks suitably premium and uses the brand’s One Connect junction box, which connects to the screen via a single cable. There’s no Freeview Play, but all key catch-up TV services are onboard (BBC iPlayer, ITV Player, All 4 and My5), as well as Netflix, YouTube and Amazon. The Q8C comes with two remote controls, one Bluetooth with voice integration, and the other a regular zapper. If there’s nothing on the box, you can always juggle them. Most will think of Philips Ambilight as a cool mood light technology, but it comes into its own with big sporting events. Not only can it create the illusion of an expansive stadium by projecting a pitch-green hue across your wall, but a cool Ambilight app can be used to mimic the colours of your chosen team. We enjoyed it during the last FIFA World Cup, and we can’t wait to run it again. And remember, if you have a Philips Hue lighting system, the set’s lighting technology can be fully integrated with that too. This 55-incher 6272 range is a slight step-up from the other Philips 6-Series, the 6262, and boasts three-sided Ambilight, rather than two, which means there’s (literally) more colour to go around. The tuner is Freeview Play with all key catch-up TV players, there’s also Netflix and YouView amongst the streaming apps. Connections include three HDMI inputs, all of which are 4K HDCP 2.2 compliant, plus component AV and two USB ports. While HDR compatible, this 6-Series model isn’t particularly bright, but resolution is high, making this a good teammate for a Sky Q or 4K BT TV Youview box, and the BBC's forays into 4K streaming. Sony’s ZD9 is a spectacular performer but even if it weren't, its sheer size puts the BIG in big matches. With ultra-vivid HDR visuals you can don your sunglasses and imagine it's Italia 90 all over again. Available in large 65-inch, very large 75-inch and GTFO of here 100-inch (the hard to find, even harder to afford KD-100ZD9) screen sizes, the ZD9 is capable of astonishingly bright spectral highlights, allied to a wide colour gamut and ultra sharp image processing. It will allow you to truly bask in the misery of England's inevitable World Cup exit at the hands of a borderline penalty decision, or see in obscenely graphic detail how Joe Root has contrived to hole out to deep midwicket when well set. Money can't buy such pleasures.